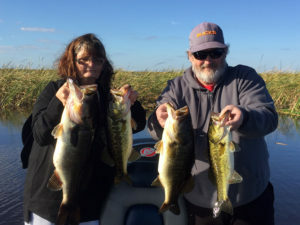 www.okeechobeejust4bass.com was fishing with Bill and Alice Stover from Missouri. Bill received a 3 Day Fishing Charter 60th birthday present from their son. They fished 8 hours a day with wild shiner bait and artificial. Here is a picture from the 22nd of some of the bass they caught.